I have always been drawn to roles that require stepping far outside of myself as an individual to become a completely different person. I adore researching a character, finding little details, motivations and nuances which help me bring the character to life. That is my job as an actor, after all; to become someone else entirely. I have had the pleasure of tackling many challenging roles throughout my experiences on stage. Between my very first role as a suicide victim, playing a severely autistic character, or even just the one who cries a lot, I have often had the pleasure of stretching myself as an actor and giving a multifaceted performance. In my experience, these characters are the most fun to play, but transforming into a multidimensional character is no easy feat. Every role takes hours of preparation outside of practices. Between memorizing lines and blocking, cues and intonation, there is a great deal of work involved in even the smallest roles. Add to that even just one additional layer of character development and the work of preparing for a role multiplies. Yet this is where the magic happens. It is the extra layers that are the most fun, the most rewarding to achieve. My role as Superintendent Detective Harry Baxter was no exception. Becoming Baxter took much more than a costume and a haircut. While costuming, hair and makeup definitely helped my transformation, I did not want to rely solely on these effects for making my portrayal of Baxter believable. I took to describing the role of Baxter as an onion; layers upon layers of character development. There were many aspects that were character specific and other aspects which were gender specific. For example, Baxter had pneumonia, which was a character specific layer of the role. I had to cough and sneeze, blow my nose, and generally seem sick throughout the play. On the other hand, I had to sneeze and cough like a man, which was a gender specific aspect. I even had to learn to laugh like a man, as laughing in a lower voice turned out to be surprisingly difficult. On the subject of my voice, there were many other details necessary to my vocal transformation of which I had to be constantly vigilant. On the gender specific side of changing my voice to sound like a man, I had to tackle the challenge of lowering my voice. I practiced speaking in the lowest range of my natural speaking voice, projecting from the chest, feeling for the rumble in my stomach and rib cage. This allowed for a lower voice without straining my vocal chords. This was particularly challenging with Baxter, as he was frequently yelling at Mrs. Piper. Additionally, I had to speak in a English accent, but not just any old English accent. Baxter needed a blend of Cockney and Received Pronunciation (also known as posh or “Queen’s English”). I spent a great deal of time going over my lines, trying to find just the right blend of the two, and noting in the script when I should slip into more of a Cockney accent and when to switch to a more posh accent. This aspect was a character specific challenge. 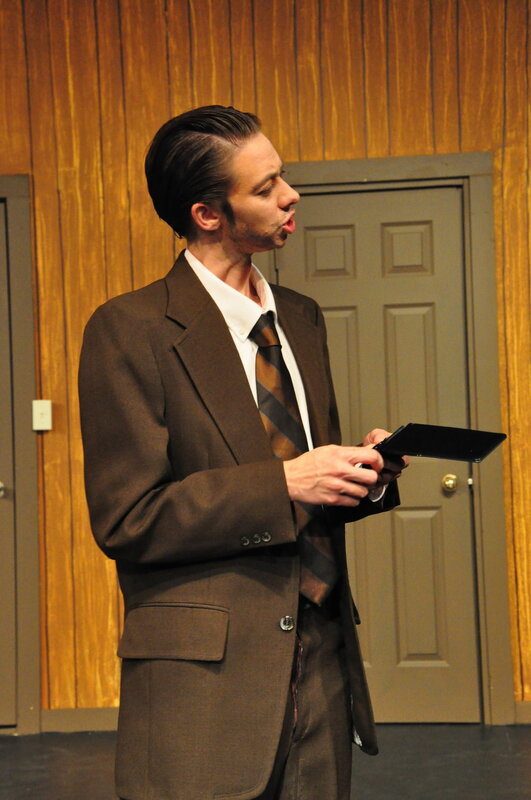 Had I played a man in a different play I might not have had to use an accent at all. And so, all of this, all of these layers, just for the sound of my voice. Even when I wasn’t speaking I had to be aware of my body language. Men tend to walk with their hips thrusted forward, as opposed to the gentle sway of the hips characteristic of females. Furthermore, when standing still, women tend to pop a hip out, resting the weight of their bodies on one leg, whereas men stand with feet planted firmly, weight distributed evenly. Also, women gesture with open palms, while men use pointed gestures and closed fists. So even when I was standing completely still I had to be conscious of how I held my body, whether I was delivering lines or not. Sitting came with its own set of “man rules”. I had to be aware of how I crossed my legs, remember to unbutton my suit jacket, take up as much space as possible, rest my arms on the armrests and not in my lap, and so on and so on. Even leaning against a desk or chair required my attention. Furthermore, I had to be aware of every little action I performed. How I opened a door, how I held a phone, how I ran my fingers through my hair, being careful not to smudge my makeup beard when blowing my nose, how to put on and off my coat, my hat, how to simply hold my hat, how I put my hands in my pockets, which pockets to put my hands in, etc., etc. The list goes on and on. And then, THEN, after all of this, I had to remember to act. As much effort as it took, I thoroughly enjoyed my experiences with the role of Baxter. All the work I put into him as a character was completely worth it in the end. I never thought I would get the chance to play the leading man of a play, and I am so thankful I was given the chance to portray this wonderful character. I would do it all again. Haircut included.